Despite all the preparation for the arrival of electronic logging devices (ELDs), the enforcement community and commercial drivers are still at odds over how the devices are supposed to work at the roadside. We’ve seen the confusion first-hand at weigh scales here in Wisconsin, and we’ve heard from motor carriers and drivers across the country who’ve been cited for violations that may or may not be valid. There are many reasons for the confusion, but I’d like to discuss what I view as the main one: the failure of many drivers and enforcement officers to know the difference between an ELD and an automatic on-board recording device (AOBRD). AOBRDs have been around for years and can look, sound, and act just like an ELD, but they don’t have to meet the ELD standards. That means they can look just like a non-compliant ELD. 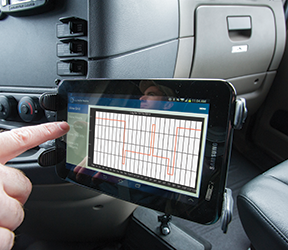 A large percentage of e-logging devices in use today are actually AOBRDs, not ELDs, and that’s because the ELD rules have a “grandfather” provision for logging devices that were placed into service before December 18, 2017. So how can you (or a driver or enforcement officer) tell if a device is an ELD, and how can you tell if it’s compliant? If your answer is, “Because it’s on the FMCSA’s ELD registry,” be careful. Some ELDs listed on the government registry may be capable of running AOBRD software. In other words, your registered device may not be a fully compliant ELD until you install the ELD version of its software. With that in mind, the following is a run-down of major differences between ELDs and AOBRDs based on the federal regulations that apply to each. If any of your drivers are using AOBRDs and are stopped for an inspection, make sure they can explain what they’re using and how it works, and why it doesn’t have to meet the ELD standards! Not required in the vehicle, but recommended: The manufacturer’s certification stating that the device complies with 395.15, which the manufacturer is required to provide. The device must be capable of transferring a digital file, on demand, via wireless web services and email or USB and Bluetooth. If an electronic transfer is not possible, the officer can review the logs on the device’s screen or a printout. The device must have a display or printout that includes total hours driving and on duty, total miles driving today, total hours on duty for the 7- and 8-day period, and a sequential list of duty status changes (no need to display a graph grid). If the officer wants a hard copy of the records, the driver and/or carrier have 48 hours to forward them to the officer after the inspection (see Interpretation Question 6 to §395.15). The device must register “driving” when the vehicle reaches 5 miles per hour or less and must switch to on-duty after the vehicle stops. Locations must be automatically generated by the device, but a driver can enter additional location data when needed. All users of the system must have a unique account and user ID. Must be able to present a graph grid of driver’s daily duty status changes either on a display or on a printout. The device must use engine data to determine when the driver is driving. All other duty changes can be made by the driver. Locations can be automatically generated or entered by the driver. User accounts are not regulated. A graph grid is not required. Drivers may be given the option to use a “personal use” setting or a “yard moves” setting.